Higher education institutions need to do more to effectively leverage technologies to meet the needs of today’s students. In Redefining the Student Experience and Flexibility and Unbundling, we talked about transforming different aspects of the student experience to match the much higher expectations of today’s non-traditional learners. This video explains how technology can help facilitate these transformations. Right now, most higher education institutions aren’t using technology to its full potential—it’s being used to automate processes but it’s not transforming them. This starts with a mindset shift that moves college and university leaders from thinking about what’s best for the institution to thinking about what’s best for the student. Once this transition takes place, it’s possible for institutions to unlock the possibilities of the tools, systems and solutions designed to improve student engagement and deliver the experience today’s learners want. 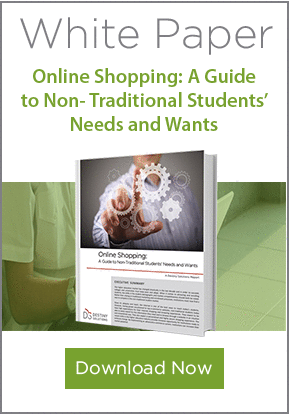 Online Shopping: A Guide to Non-Traditional Students’ Needs and Wants: This whitepaper by Destiny Solutions provides insights into how institutions can leverage technology to stand out to non-traditional students in today’s immensely competitive higher education environment. It shares some industry best practices that apply to the postsecondary space and provides a pathway for institutions to follow to succeed over the long term. Service to Students: It’s a New Day: This article by UCLA Extension Dean Wayne Smutz explores how institutions can leverage a high-tech/high-touch approach to transform and improve the experience it creates for students. According to Smutz, institutions need to make better use of technology to allow their staff to dedicate their limited time to work that has a genuine and noticeable impact on students. Without effectively leveraging technology, it’s not possible to deliver on the expectations of today’s learners. Efficiency: The Secret Top Schools Already Know: In this article by Destiny Solutions CEO Shaul Kuper, he outlines how efficiency extends beyond simply automating processes. True efficiency, according to Kuper, relies on an institution managing its processes and infrastructure in the most effective ways possible while creating the best possible experience for students. Automation is a good starting point, but student-centricity requires going beyond that. Taking the Lead: How IT Delivers the Experience Students Expect: This interview with Michigan State University CIO Joanna Young sheds some light on the active role institutional IT teams can take to deliver a world class experience to their students. It starts, according to Young, with understanding that the fundamental role of IT is shifting from builders to relationship managers. After all, it’s more effective for institutions to leverage specialized tools and systems developed by vendors—bringing together and managing a host of best-in-breed solutions to meet their specific needs—than it is to try building everything from scratch. Right now, IT units do a great job of automating existing processes, but it’s time to put the tools, systems and infrastructure into place to transform the way universities work.